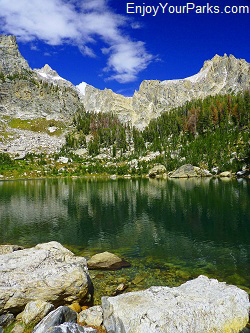 Amphitheater Lake, Grand Teton National Park. The hike to Amphitheater Lake in Grand Teton National Park is among the popular Grand Teton hikes but is not an easy one. 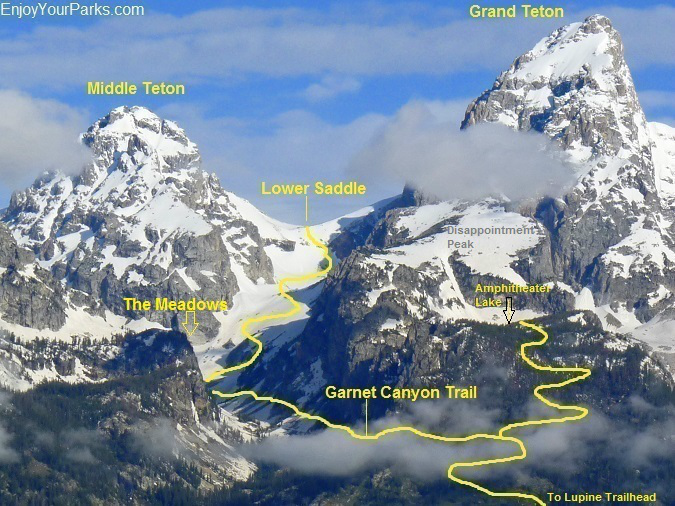 There is a fair amount of elevation gain (nearly 3,000 vertical feet in 4.8 miles), so make sure you are in adequate physical condition before attempting this Grand Teton Park hike. The Amphitheater Lake hike begins at the Lupine Meadows Trailhead, which is located on a short 1.5 mile gravel road that is found just about a mile south of the South Jenny Lake Junction on the Teton Park Road. There is an obvious sign along the Teton Park Road where this junction occurs. The trail is initially quite easy and level, but begins to steepen after the first mile and a half. 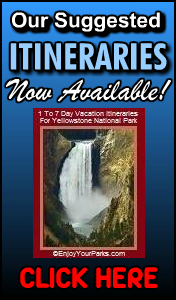 As the trail then begins to work its way up the east slope of the Tetons via many switchbacks, you will get an excellent view of the eastern prairie, as well as a view of Taggart Lake and Bradley Lake far below you to the east. There are two junctions found along this trail. The first is where the Taggart Lake Trail connects to the trail that you are on, at about mile 2.0. 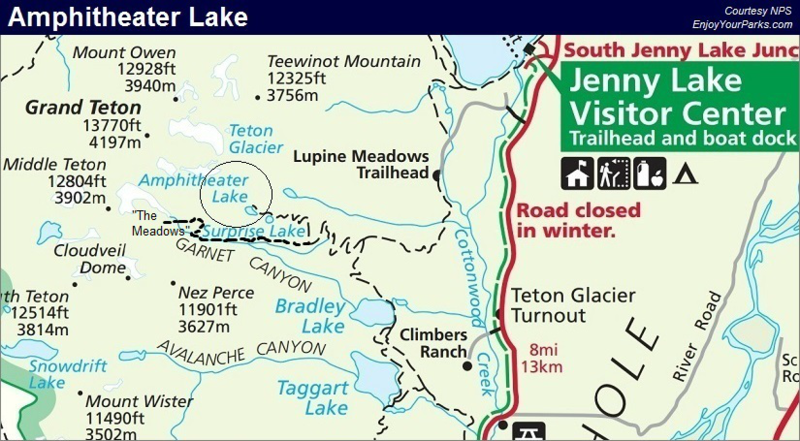 Make sure you stay to the right and do not take the Taggart Lake trail that is to your left. We've seen plenty of hikers mistakenly take this wrong turn, especially on their way back down the mountain. The second junction occurs approximately one mile further up the trail, which is the Garnet Canyon Trail junction. Make sure to head to the right at this junction. Both junctions are very well marked with signs showing you the way. If you pay attention to the signs, you'll have no problem navigating these junctions. This is a view of Bradley Lake and Taggart Lake to the east as the trail works it's way up the many switchbacks on the east slope of Disappointment Peak. 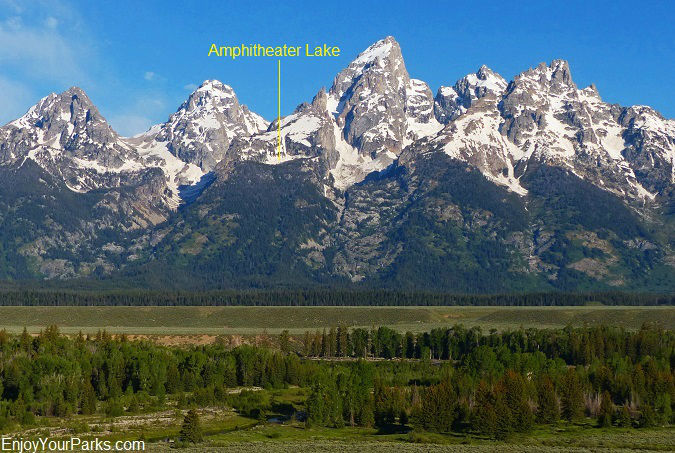 This photo shows where Amphitheater Lake is located in relation to the surrounding mountains of the Central Teton Range in Grand Teton National Park. 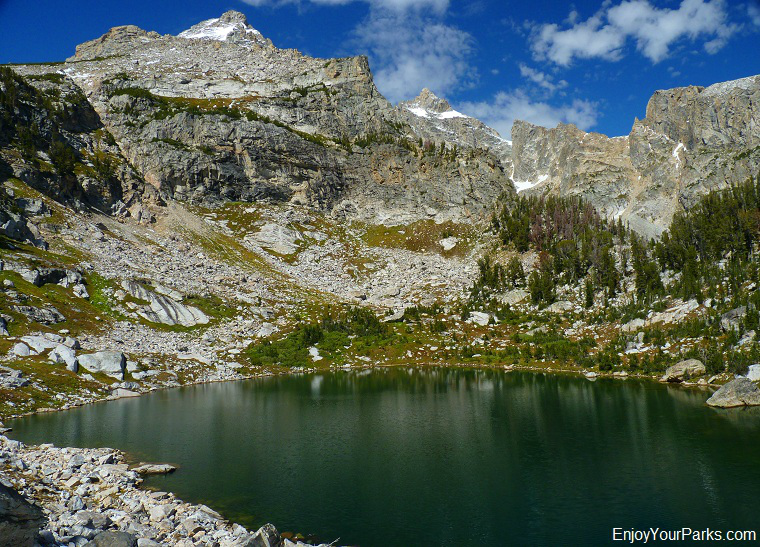 Just before you reach Amphitheater Lake, you'll hike by a smaller lake called Surprise Lake. You can walk down to the lake if you'd like, or keep moving to your final destination, which is Amphitheater Lake. 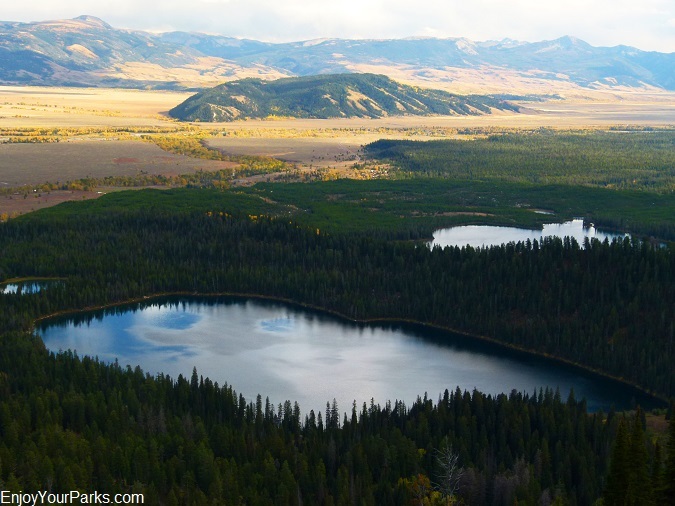 As you get closer to the lake you will begin to see Grand Teton to the northwest, and as you reach the lake, you will see not only Grand Teton, but also Disappointment Peak, Mount Owen and Teewinot Mountain. These huge peaks create an amphitheater effect, thus the name Amphitheater Lake. There is a backcountry campground located between Amphitheater Lake and Surprise Lake which is available for those of you who don't mind lugging your overnight packs up 3,000 vertical feet in less than five miles. You must have a backcountry permit to stay at this Grand Teton backcountry campground, so make sure you get this reservation far in advance. 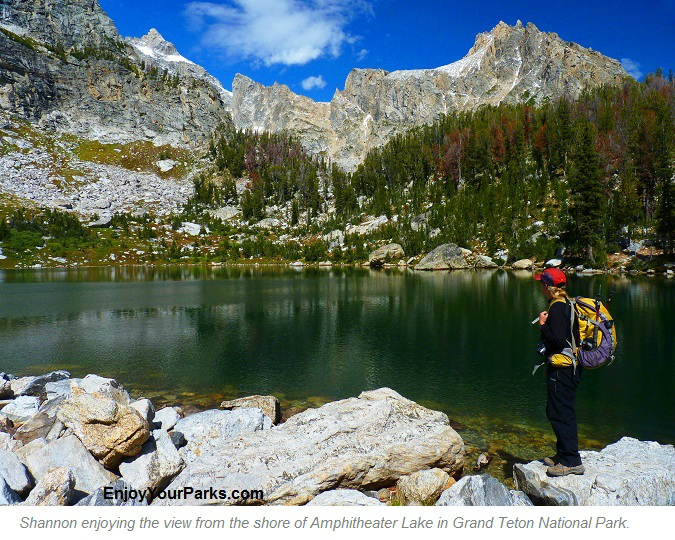 The view of the mountains that surround Amphitheater Lake from the shore is amazing, and it's a great place to enjoy your lunch and take in the beauty of this special area of Grand Teton National Park. If you want to explore the area, we recommend that you take the trail around the right side of the lake (northeast) and follow it up until it takes a turn underneath the huge north wall of Disappointment Peak. 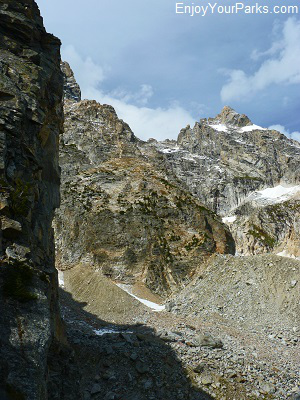 This vantage point gives you an interesting view of Mount Own and Teewinot Mountain (See photo to the right). There is also a trail from the foot of Amphitheater Lake that takes you up to a ridge to the southwest of the lake that looks onto Garnet Canyon to the south. This vantage point also provides a very interesting view. Here's another view of the Amphitheater Lake Trail and Garnet Canyon Trail from U.S. Highway 89 in Grand Teton National Park. This gives you a better understanding of the "lay of the land".